Although anxiety disorders affect one in eight children, they often go unrecognized as mental health issues in teens. Social anxiety disorder, in particular, can take many forms and present differently depending on the individual, thus making it challenging to identify. Most parents and adults dismiss anxiety symptoms as merely shyness or teen angst that their children will eventually outgrow. However, social phobia, as the disorder is sometimes referred to, can grow worse if left untreated and become debilitating over time. Poor academic performance, missing opportunities for significant social experiences, and substance abuse can all be indicators of social anxiety. Recognizing social phobia in teenagers is crucial for their transition to adulthood. Parents and other caregivers have the responsibility of ensuring that they get help. 1. 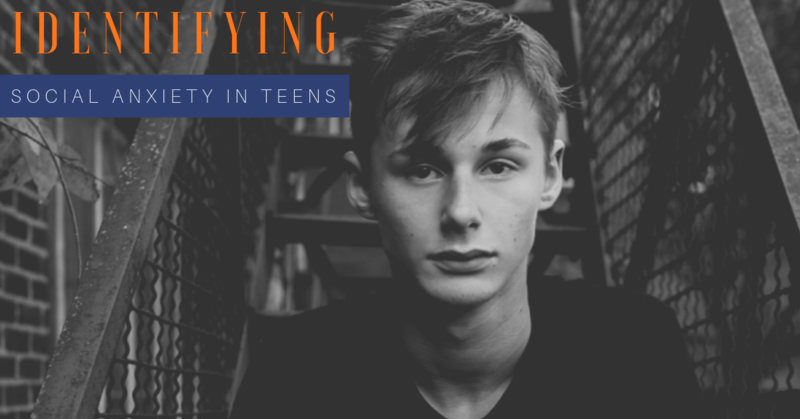 Be aware of extreme shyness or discomfort in your teen when he or she becomes the center of attention. First-time performers typically experience stage fright but extreme discomfort, passivity, or inactivity, when put in the spotlight, merits further investigation. Although most people may feel this is due to teens’ fear of embarrassing themselves in front of their peers, do not be complacent. Take the time to talk to your child about why he or she was unable to perform. Avoid using an accusatory tone to prevent putting your child on the defensive. 2. Pay attention to your child’s academic performance. When your straight-A teenager starts bringing home B or C-graded homework and exams, you immediately worry that something is wrong. Unfortunately, social anxiety is not as apparent as dropping grades. Social anxiety provides small clues such as hesitance to talk in front of the class, fear of being asked to report information, or even downright refusal to be a part of class activities. If possible, talk to your teen’s teacher about your concerns and ask him or her to inform you if your child exhibits any of these behaviors. 3. Be aware of your teen’s friends or lack thereof. It is common for teenagers to spend hours texting, going to parties and events, or hanging out after school. Many teens will be part of a large group or at least have a couple of friends. However, teens with social anxiety often isolate themselves from other people or minimize contact. They would rather attend class without homework than ask a classmate about the assignment. They may have trouble making eye contact, initiating or joining conversations, and being part of school organizations. 4. Observe your child’s confidence level. Most teens who are suffering from social anxiety doubt if they are good enough for other people or worry excessively about how others see them. Their fear of being ridiculed or rejected is solidified in their minds, and they often look for signs of negative perception in others. This negative attitude towards meeting other people is so pervasive that it can lead to low self-esteem and an inferiority complex. 5. Take note of your teen’s reaction to social situations. People suffering from social anxiety exhibit physical symptoms as well, especially if they are in a social situation such as family gatherings or school functions. Signs to look out for include diarrhea, nausea, excessive sweating, heart palpitations, and shortness of breath. If your teenager experiences any of these symptoms before or during a social event, he or she may be experiencing social anxiety. According to the 2015 Child Mind Institute Children’s Mental Health Report, 80 percent of kids with a diagnosable anxiety disorder are not getting treatment. If your teen exhibits any anxiety symptoms, take him or her to a psychologist for a consultation and thorough examination. The chances are high that your child knows that his or her reactions to social activities are irrational but does not know where or how to ask for help. Ensuring that children get the support and treatment they need starts with their parent or another adult caregiver. For more statistics on teen anxiety, visit The Anxiety and Depression Association of America . Watching fifteen minutes of hilarious animal videos with your child helps stop the intensification of anxiety, contributing to a feeling of control over it. Anticipatory anxiety is normal but preventing it from taking over is essential.